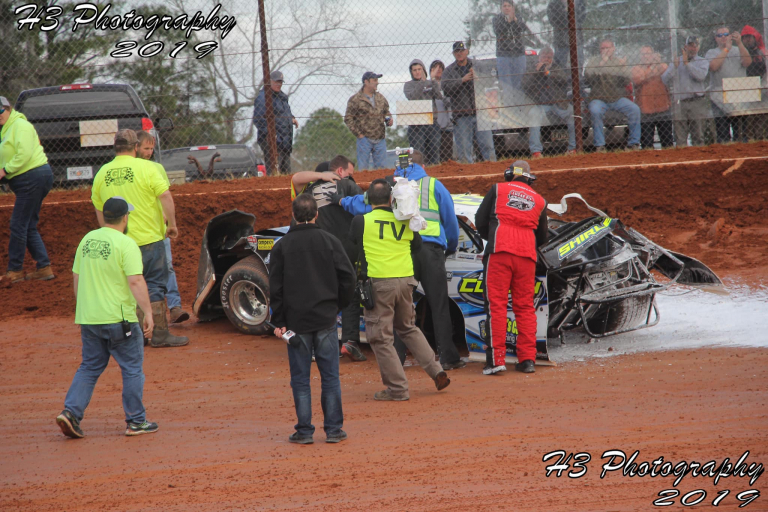 On Saturday, Golden Isles Speedway hosted two feature events. The first was a makeup feature from the rain out in the night prior. 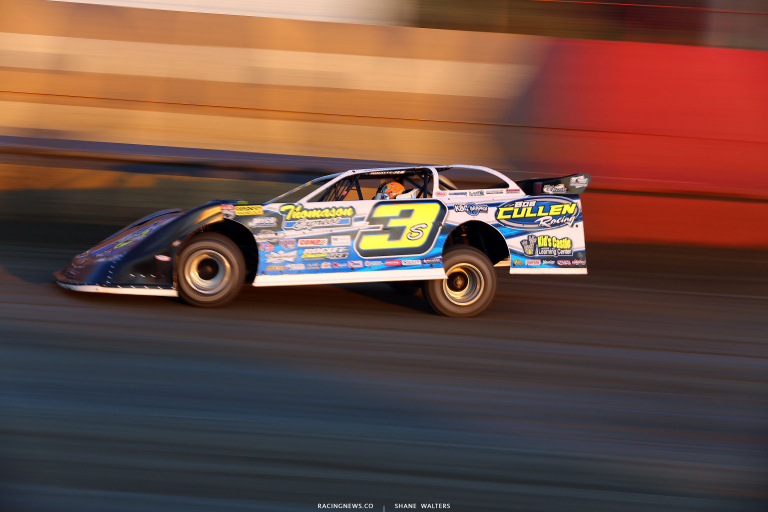 He was running in the 8th position, in a battle with Scott Bloomquist and Kyle Bronson. Suddenly, Shirley was pointed toward the outside heading into turn three. Nose first, he caught the wall. He then began to climb the wall. He was pointed skyward. The car went into a barrel roll at the fastest point on the race track. It rolled sideways across the top of the wall. The left rear wheel went flying about a hundred feet away from the car. Almost three complete barrel rolls later, the car came to a stop on it’s roof in turn three. The medical staff arrived quickly. They rolled the car back on it’s wheels and Shirley climbed from the machine under his own power. We’ve all seen the video. But, I don’t think many people know what started that crash, including myself. Do you know what happened? And it didn’t start any better. Shirley unloaded the backup car and took it to the track for hot laps. He ended up getting a push back to the pit area without a lap of practice. I would assume that’s your backup you rolled out. What happened in hot laps where it lost drive? Then, things took a sudden turn. Shirley went out on the track without practice and put it on the pole! You put it on the pole with no practice. How does that happen? Just years of coming down here? Shirley ended up with a rough heat race, finishing 6th. 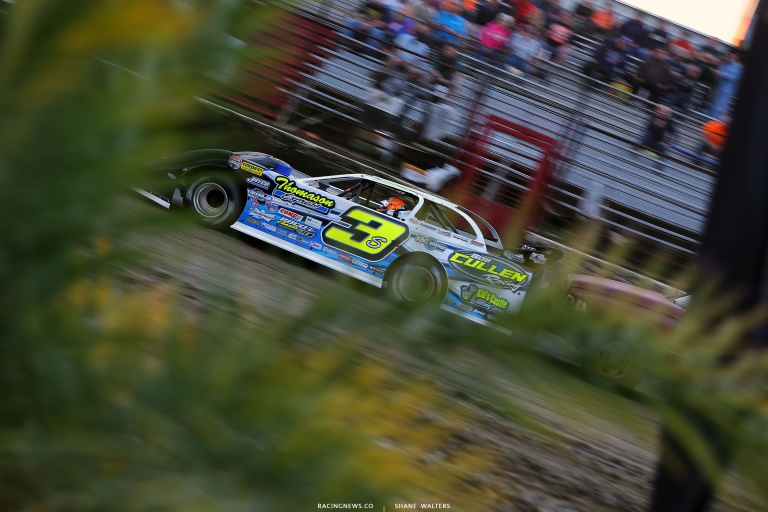 He made it into the feature on a fast time provisional and finished 25th. On Tuesday, Shirley qualified 3rd in group A. He then finished 2nd in his heat race. He finished 6th in the feature as Tyler Erb went on to pick up his 3rd LOLMDS win of the year. The third night of six at East Bay Raceway Park is set to get underway. “That’s the good thing about this deal. You get six night to figure it out,” Shirley stated. Is a backup car really a backup? Or is it more of a clone of the primary car? How bad is that car? “We’ll send it back to Rocket when we get home. We’ll see what they want to do with it. If it’s salvageable or if we need to put a new frame under it,” Shirley concluded. You can view the partial Brian Shirley crash video below. That’s all the Lucas Oil Racing TV coverage caught of the incident. Brian Shirley Flip at Golden Isles!